So after a few nights through the week burning the midnight oil (or is that LPG? ), I'm at the point where Ben's frame is ready for paint. This is where I think frames are at their most beautiful, before the paint (however thin) hides all that delicate detail. Anyway, here are a bunch of pictures. Please do click on the pictures to see larger versions. Those that come up in the blog are rather small. Starting with the head tube. I polished up the nice little Llewellyn ergo bosses. They're fitted with brass adjusters from Ceeway. As mentioned in previous posts, the head lugs are Llewellyn Cadenzia, with added cutouts. More detail of the lower head lug cutouts, and showing the shorelines. The top head lug has similar cutouts to the bottom. Also visible here is the rear brake line port. It's on the right side, because here down under, we usually run the rear brake on the left lever. 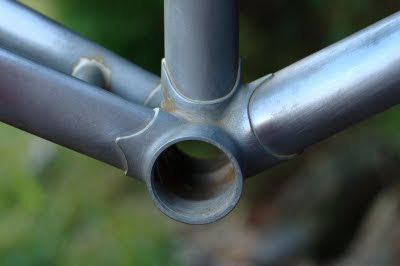 By running the brake line around the right side of the head tube, It will then have a much neater bend. That's the theory, anyway! Turning now to the seat lug, you can see the difference that taking material off the rear skirt section of the lug makes. I think it looks a lot cleaner and more minimalist that the original lug. 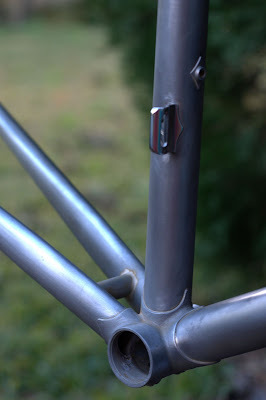 The seat stays were brazed on with system 48, which builds lovely fillets at silver temps. More detail of the seat lug. Here you can see the shaping I do to the back of the binder. I love the shape of the top of the Llewellyn seat lug - very organic. A shot from the other side shows the rear brake cable port, which is in the conventional position. Also, the triangle cutouts. I really like like how these turned out, and will definitely do them again on subsequent frames. The brake bridge. What can I say? It's the bit you bolt the rear brake to. These bits can actually be a little annoying to braze, as the goal of keeping the cutouts free of silver while putting a fillet on the bridge just a couple of millimetres away is rather contradictory. This is where teeny tips are used. The dropouts. My fingers are sore. Here's the bottom bracket area, showing also the chain stay bridge and front derailleur tab. 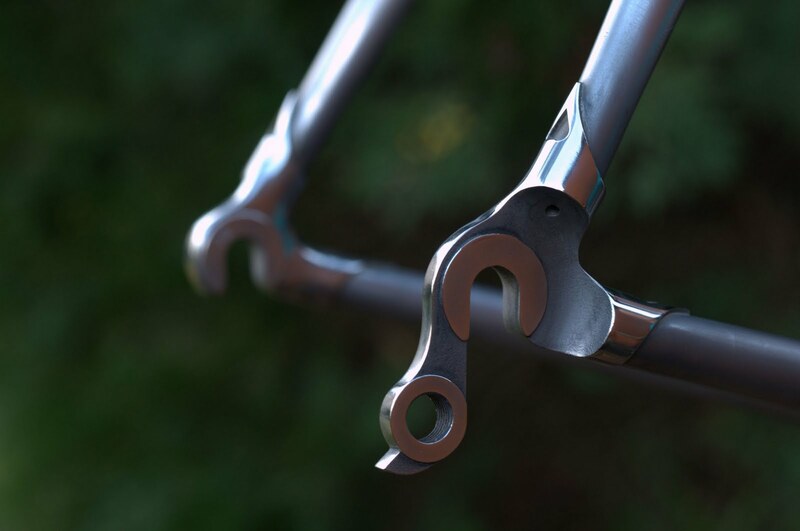 More detail of the bottom bracket, showing the neat shorelines that are possible with system 48. This stuff builds bigger fillets than 56%, but cleans up readily. The neat thing is that it fills gaps. And finally the whole thing, to put everything in context. I think the XL tubes look good on this size frame - they make a frame that otherwise would look spindly look more normal. This is 57cm long and 58 tall. It's probably about the smallest frame I'd want to do with XL tubes. For reference, the frame weighs 1950g. That's for Columbus Life tubes. Contrast that to the 1680g I got for Kristyn's compact frame, with cheaper Zona OS tubes. Yes, the frame is bigger, but I think the XL tubes do have a bit of a weight penalty.